The DiMarzio Tone Zone, a monster pickup that takes some taming. In the quest to make my Ibanez 20th Anniversary RG550 RFR really roar I decided to take on the DiMarzio Tone Zone. I had previously installed the DiMarzio PAF Pro in the bridge position, and as I mentioned in my PAF Pro review I found that it just didn’t drive my amp hard enough. I loved the tonality of it, but I didn’t want to have to kick an overdrive every time I wanted to use this guitar to get a similar amount of gain as I had coming from some of my other guitars. The DiMarzio Tone Zone is a fairly polarising pickup amongst guitar players. It is a pickup that people either love or hate, and this love/hate relationship probably stems from its tonal properties. With an Alnico 5 magnet, a bass and middle rating of 8.5, and treble of 5 on the DiMarzio scale, the stats give you an immediate impression of massive low end grunt. To some this is massive fat high gain heaven, to others its high gain mud. As I had mentioned earlier I was installing the Tone Zone in my Ibanez RG550. This guitar has a basswood body, and maple neck/fretboard. Acoustically my guitar has quite a thick low-end, and this tonal property did worry me a bit since the Tone Zone has such a massive amount of low-end. On the initial installation of the Tone Zone I was hit by a massive wall of low end tones from my guitar, and very little high end to help it cut through. It did concern me a bit as it was far too muddy for notes on the low E string. I wasn’t about to give up on it just yet though, and was fully prepared to tweak things. I had previously performed magnet swaps on a couple of pickups, and tried out the “half-air” mod that a lot of people perform on Tone Zones, and was prepared to open up the pickup if needed. I wanted to try and increase the high end and drop the low end a bit without the need for pickup surgery though. After doing to research and asking some questions on forums I decided to try lowering the pickup a fair amount, and raising the 3 bass side screw pole pieces. I ended up with the pickup on the bass side of the guitar about 3mm above the pickguard, and the treble side a little higher. I screwed the 3 bass side pole pieces out so that the screw heads were pretty much sticking out the the guitar , and kept the treble side ones flush with the pickup bobbin. My setup for the Tone Zone, note the 3 raised polepieces on the bass side. I found that the sound was far more pleasing after these tweaks. The low-end was still very big, but not in a bad way. Keeping the pickup fairly low from the strings tamed the low-end, and raising the pole-pieces added enough high end to give the pickup clarity to go with its massive punch. The Tone Zone works fantastically for big heavy rock, punk and metal styles as it provides a great amount of chunk and grind. It also responds very nicely to your pick attack, which gives you far more flexibility than most high output pickups. Rhythm parts sound absolutely massive, and lead parts higher up the fretboard retain a fatter sound than what you would get from most bridge pickups. One thing that needs to be remembered when talking about the Tone Zone is that in standard series humbucker mode it is not a very good pickup for clean tones. This pickup is designed to rock through the dirty channel of your amp. Through the clean channel it will sound big and nasty, with a slight overdrive that is pretty unpleasant. However split it and combine a middle single coil pickup and you will find some pretty cool Strat-like tones that work nicely both clean and overdriven. The DiMarzio Tone Zone is a fantastic pickup for a huge rock sound. With a little bit of tweaking of the pole-pieces and the pickup itself you will find that you can have a massive low-end wall of sound, and still retain enough clarity to sound nice and articulate. If you haven’t tried the Tone Zone go and try it out, and if you have and found it too muddy maybe give it another go. Play with the pole-pieces and lower the pickup a bit, and you might find that you can tame the beast a little, and make it work to your liking. I can’t believe that I haven’t already written an update for this review. You may have read all my posts about taming the Tone Zone (part 1, part 2, part 3). I learnt some pretty cool tricks throughout this process, but in this particular guitar (The RG550) I was never completely satisfied. A while back I installed the Tone Zone into my alder bodied Ibanez RG-style custom. I reverted it back to the stock pickup before installing just to get an idea of what the stock Tone Zone would sound like in alder. Wow! That’s all I could say. Any short comings the Tone Zone showed in my basswood bodied RG550 were non-existent. The Tone Zone was perfect to my ears in Alder. The Tone Zone is still big and brash, but not boomy. There is a great degree of clarity on single note runs, and power chords just chunk and grind in such an awesome way. I think I found my perfect tone with this setup, and now I really want to put together an alder strat type guitar with maple neck and fretboard, with a Tone Zone, and maybe some sort of single in the neck. So if you have an alder-bodied guitar, and are looking for a big, fat, heavy sounding pickup that style has some nice clarity for single notes higher up the fretboard add the Tone Zone to the top of your list. 16 Responses to "DiMarzio Tone Zone – review"
Hi, is the tone zone the same height as the ibanez v8 pickups? I want to install it in the bridge position of a direct mounted ibanez RG, if it’s taller than the v8 I afraid I won’t be able to lower it down..
Hey there, without pulling the Tone Zone out of my guitar and measuring, yes they both look to be about the same height. 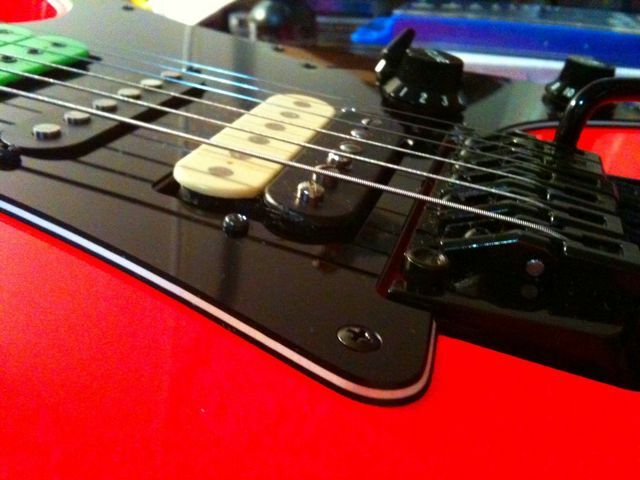 You should be able to raise or lower direct mount pickups to some extent. They typically have some foam underneath to help keep in place, and allow some adjustment. I’m saving my pennies for a Charvel So Cal in Candy Blue, and the update portion of this review got me all bothered about it. “The Tone Zone is still big and brash, but not boomy. There is a great degree of clarity on single note runs, and power chords just chunk and grind in such an awesome way. ” yes please! Can’t wait to dig into that guitar with some of these protips! Keep it coming plz! I’m sure you’ll love it. I’d love one of those So Cals too. Awesome axes. Well, a few months of layaway later, and the guitar is mine! Charvel Pro-Mod So-Cal 2H MIJ in “Candy Blue” (actually more of a medium sky blue, not quite as green as daphne and a touch deeper/darker.) I’ve only had it a few days, but I’m already blown away by the attention to detail and general quality of this guitar. You could buy a similar strat from fender for twice the cost and STILL not get a quartersawn neck and compound radius fretboard. Feature for feature it completely shames the american standard series for the price, it’s no wonder it was discontinued! Can’t comment on the pickups yet, as I don’t have a proper amp again. Starting from nothing after 10 years of playing guitar, I can’t believe it! Anyway, I’m scanning through these articles again, looking for inspiration to make a great thing even better. Gonna change out the tiny, tiny floyd block (have you seen these things?) for a heavy brass one first, probably. I didn’t think I was gonna care so much, but that little chrome thing leave SO much wasted space in there, haha. Anyhow, keep up the great work, seems like you are doing well. More DIY articles! Well now you’ve got me jealous, I’ve been GASing for one of these for so long!!! Congratulations on your new guitar purchase, I hope it serves you well. The brass block upgrade should make a world of difference too, making an already killer axe completely amazing. Are you running the Tone Zone with a 500K? I have a Charvel with a basswood body and Tone Zone it and I took the bar out and love it in that. But when you talked about how much you liked it in you alder body strat it made me think. I have a alder strat with a Pearly Gates + in now that is just to bright and not much depth. I was looking for a new humbucker and think I may put another TZ in it since I like it in the Charvel. It has to single coils N/M that are Texas Specials, I am thinking I need to find away to run those with 250k’s and the Zone at 500K? Any ideas? Hi Stan, yeah I really dig the Tone Zone in alder. If you have a look at this article I wrote for the Seymour Duncan blog, I detail how I built a switchable pot that can go from 500K to 250K using a push pull pot or DPDT switch. I will bookmark that and maybe give that a try. Just wondering since I have a TBX tone pot with no-load at center detent on bridge now would that should give me the 500k sound with the TZ in it? Thanks for your hard work and ideas to the guitar world! PS I almost ordered either a SD 78 or a the frank EVH for it, but the TZ is much cheaper and I do love it my other guitar, and you dig it the alder, so I think it would be the smart move at the moment! I’m not 100% sure about the no load pot. I’ve got an EVH Frankenstein in my recently finished strat porject. Sounds amazing, and will have a review for it soon. It is a lot more expensive than the Tone Zone though, you are right there. I was lucky enough to trade it for a pair of EMGs. Man I can’t wait for your Frank EVH review! Like I had said, I dig my modded TZ in my basswood Charvel. But in my alder American strat I may go with another TZ or a 78 or a Frank EVH. As those both make me interested. If I don’t go the TZ again I am leaning towards a 78 because on paper it sounds like a better match output wise with the singles in the neck and middle also I can order it in the color I want and in “F” spacing. Why do we obese with magic tones, ha! Well, keep an eye out, it’ll be finished soon. Don’t take resistance as a measure of output. It only tells you how compressed the tone may be. The EVH Frankenstein is only a moderate output pickup and would work just fine with singles. But I still wish the EVH Franenstein offered at the least some color options. As always nice to hear feed back from ya. One other question for you, is the TZ in the alder Strat stock or aired? The one in my basswood charvel I aired and I like. And I have found a Frank for about $100 so I guess now in the strat it will be a frank or TZ again. I don’t care if it’s “F” spaced or the right color now. But like I said from all I have learned is I will get a Frank or TZ and could be a 78, I just don’t if I can come to grips with the $150 + of the 78 and after much homework I am now leaning more Frank or TZ. THe Tone Zone has always been stock for me in alder.